Nirekha Peak Climbing 17 days trek is a moderate trek. Travelers who can walk up to 6-7 hours a day on an uphill and downhill trail will find this trek fulfilling. It is best that we prepare ourselves for the Annapurna trek by jogging and exercising regularly at least a month prior to the start of the trek. Trekking to the Everest Base Camp should be relatively easier for those who have experience walking/trekking in a high altitude environment. Past hiking experience would be an asset but no technical skill is required for this trip. It is also important that we consult our doctor. Participants with pre-existing medical conditions such as heart, lung, and blood diseases should inform Discovery Mountai Trek before booking the trek. 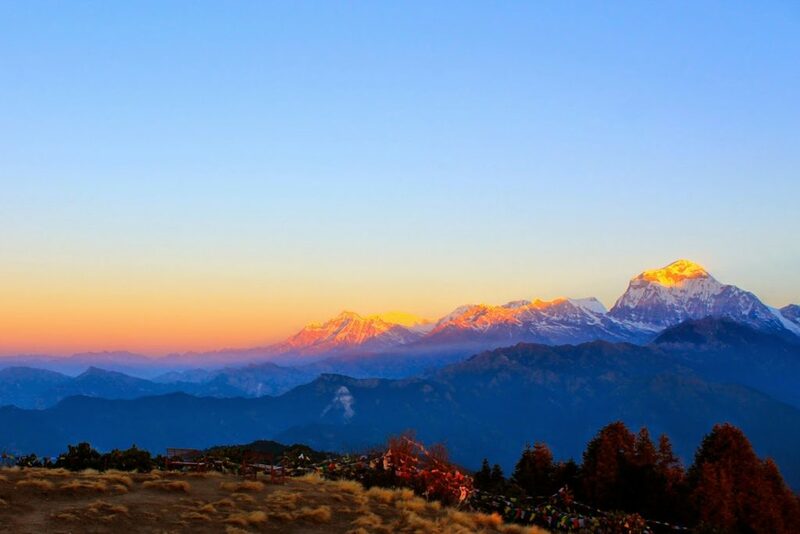 The best time to trek to the Nirekha Peak climbing is Spring (February to May) and Autumn (September to November). The temperature is moderate in these seasons and guarantees amazing views through the trip. Although this trek can be undertaken during winter, the cold temperature might not be suitable for everyone. Nirekha Peak Climbing (6159 meters) located is close to the Tibetan border and Mahalangur Region eastrn part of Nepal. Nirekha Peak is Close to the Lobuche East Peak and which is east of the Cho-La Pass. The ascent itself is steep so it does require Harness, Jumar, Decender, Crampons, Ice-axe, and fixed rope. This peak is recently opened in the listed of (N.M.A.) Nepal Mountaineering Association on the categories of (Group A). It has two routes to ascent on the top, one from base camp 1 and the other one from kangchung base camp. The climb from kangchung base camp is easiy and short but there is some glacier on the Chola Col and there are several deep crevasses. So here our experience Climbing guide will decide according to weather and routes condition. The first ascent was done Greg Valentine and Matt Florets in 2003 April. The second ascent was done by all women team in 2003 october. This Peak climbing start with 35 minutes scenic flight from Kathmandu to Lukla, You enter in the Khumbu Rigion estern part of Nepal and the majority of buddhist culture, You will get good experience of two difference valleys that one you follow common route to the Nangpa Valley close to the Rolwaling then you cross famous trekking pass called Renjo-La Pass (5360 Meters) and enter in the famous trekking trail Gokyo Valley, explore the Gokyo Peak and religious Gokyo lake. Then you head to the Nirekha Peak base camp for your climb to top. The climb is roughly on snow and ice. It is quite technical to climb but from the summit incredible view including Mt. Everest, Mt.Lhotse, Mt. Cho Oyu, Mt. Makalu, Pumori, Cholache, Thamserku, Nuptse and many others above 6000 meters peak. After experience the Himalayan trekking peak summit. Your adventure come to end at Lukla decending through the traditional market Namche Bazaar. We Discovery Mountain Trek & Expedition, are more then happy to design your trip to Nirekha Peak Climbing with our experienced climbing guide and staff for you complete satisfactions. After Namche, we separate from the classical route of Everest Base Camp and walk into the left corner onward Thame Village. It is the oldest village of Sherpas, used to be a trade route to Tibet. About 160m above the town there is the Thame Gompa, a picturesque monastery set amongst the many homes of Lamas and lay people. We climb up to reach to the Sumdar Peak which is quite unknown but rich in beauty of nature as a climb mountain above Thame and thus very little frequented. This is why it is not so easy to climb. Technically not difficult, and we will climbing up to 1000m from Thame. From where we have outstanding view on the Himalayan vista. After all back to Thame. From Thame the trail heads north to Thame Teng and on through several small villages such as Chanakpa, Taranga, crossing through the yak field to reach Marlung village, We walk approx 1 and half hours at deserted hill side to reach Lungdeng where we will overnight at basic guest house. This day is a big day! Crossing the Renjo La will be difficult to climb due to the altitude and its nature of walking. Typically the weather is clear at spring from March to May and from Sep to Nov thus the prospects for favorable conditions are excellent. Upon on reaching to the top of Renjola, the views are just outstanding. Walking onward to Gokyo involves a glacier walk for sometimes where carefully waking required, and then the entire walking to Gokyo is via easy walking down. Walk Early in this morning we hike up to Gokyo Ri from where the view offers Mt. Everest, Makalu, cho oyu, Lhotse, cholache, taboche, thamserku pumori and many more. This will be unforgettable life time memories and enjoy around the top. We have a great memories and stroll back an hour’s to Gokyo for breakfast. We trek down to Thaknak for the overnight passing through the Nazhumba glacier. We start our trek after lunch, today we have an easy day gradual walk up to the Nirekha Peak Base Camp . Our guide will give you training for climbing techniques and the best ways of using climbing gears such as the ice axe, climbing boots and crampons, harness, ascender. The training will also include knot making and using ropes to move up and down. We can spend the remainder of the day resting for the next day’s climb. Today we start our adventure which is summiting the Nirekha Peak. We get up at midnight for breakfast and begin trekking from 1:00 am. We begin our trek on a flat snow-covered trail before ascending on a steep path towards high camp. The peak is very technical and from high camp with a gradual ascent of about 20 degrees followed by a very steep ascent on a narrow ridge. Both main rope and fixed ropes will be used. We also come across a few crevasses before reaching the summit. From the summit, we get excellent views of Everest, Lhotse, Nuptse, Ama Dablam, Tawache, Cholatse, Pumori, Changri and others. After a safe and successful trip to the top, we safely make our way down to the Base camp. This is a separate day reserved for any contingency. If we are not able to summit the Nirekha Peak on the day as planned due to bad weather or any unforeseen event, this day can be use. Today we descend on a trail next to the Ngozumba Glacier. We pass through Phangaa village which was hit by a big avalanche in 1995 killing forty people. From here, we descend further and pass a chorten. We continue our walk to Machermo. We start our trek gradual up and down to and passing through several villages like Luza, Dole and Portse Thanga where we have our lunch, then we start to climb until Mong-la, After passing Mong we descend down on stone steps and are in company of the beautiful Mani Walls. We continue our walk Kyangjuma.